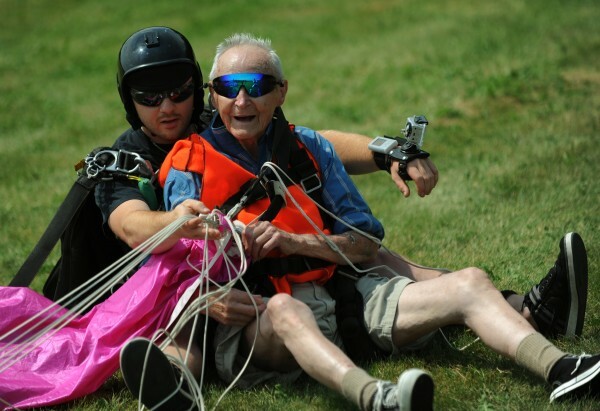 90-year-old Lester Slate of Exeter (right) sits on the ground with tandum skydiving instructor Matt Riendeau after jumping from an airplane at 10,000 feet for his 90th birthday at Central Maine Skydiving in Pittsfield on Sunday, July 15, 2012. 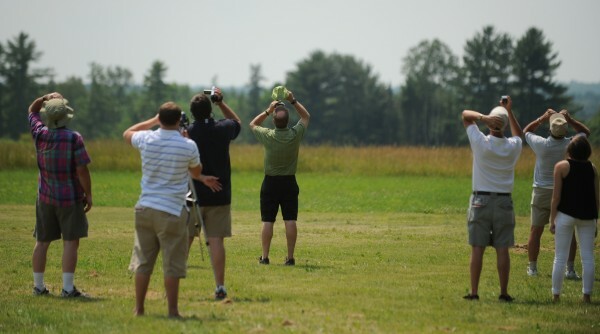 Friends and family of 90-year-old Lester Slate of Exeter look to the sky as Slate jumps from an airplane at 10,000 feet for his 90th birthday at Central Maine Skydiving in Pittsfield on Sunday, July 15, 2012. PITTSFIELD, Maine — Captain Lester Slate of Exeter was still a tiny speck in the blue summer sky Sunday afternoon as his family and friends began cheering him on during his 90th birthday present to himself — his first skydiving jump from an airplane. Then the speck got bigger and bigger, turning into a parachute that slowly, gracefully swooped to the ground with Slate and tandem jump instructor Matt Riendeau aboard. Another skydiver trailed a big American flag in the air behind him. “Let’s have a big round of applause for Les,” one man shouted on the ground. The jump at Pittsfield Airport through Central Maine Skydiving was the culmination of a long-held dream that began when Slate trained as a Navy pilot during World War II. His Sunday jump was anything but an emergency. More than 50 people gathered with birthday balloons and refreshments on the grass off the tarmac to support Slate, a veteran who flew planes for 40 years in both the Navy and the Coast Guard. “We hunted moonshiners way down south, and icebergs way up north,” he said before taking out his hearing aids to make the jump. Slate, a soft-spoken gentleman with a twinkle in his eyes, said he had been inspired by former president George H.W. Bush, who jumped safely from an airplane on his 85th birthday in 2009. He is the oldest person to jump through Central Maine Skydiving, according to staff there. “Everybody’s got to do their own thing. This is his thing,” he said. One of Slate’s friends, Maynard Weymouth of Lincoln, said the former pilot was a hero who served with distinction in the Navy during World War II. As a rescue pilot, Slate once flew to pick up a downed pilot who was too close to a Japanese-occupied island. The 18-foot-high seas were dangerous, Weymouth said. “They were afraid they were going to get shot down by the Japanese army,” he said. Weymouth said Slate was familiar with the Pittsfield Airport. It’s where he trained as a pilot in the 1940s, and where he met his wife of 65 years, Maxine. “He’s just a fantastic man,” he said of Slate. Slate and Riendeau approached the ground, then landed safely, as his family clapped. Slate was helped to his feet. “It’s my land legs I’ve got to get back,” he joked. Later, he said that his parachute jump was terrific — and he’d like to do it again. “When I get to be 95, or maybe 100,” he said.